So my boys love Marvel's Superhero Squad cartoons and toys. 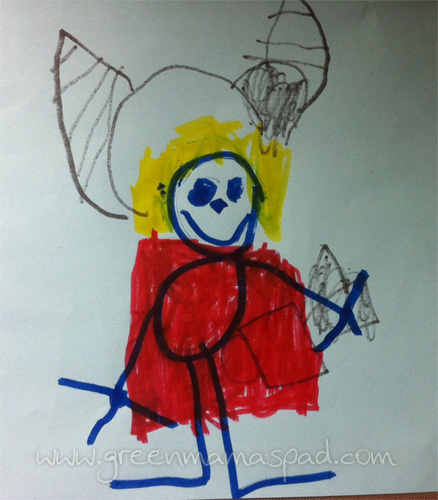 My six year old came home from first grade last week with his rendition of Thor. That's a great picture. It realy looks like him!! LOVE IT! He did a great job. My daughter is all the time drawing. I can't even tell the difference! ;-) He did pretty great with the details. Such a great job! It's adorable! I gotta give it to him...that's a pretty darn good picture! Wow, he did a good job! He did a great job! I love how he got the details. I'm impressed! What an awesome job! That is pretty darn good artwork! You've got an artist on your hands! That's an amazing picture! He has talent! I love Thor!! 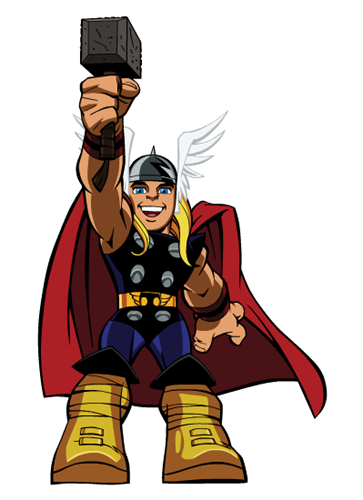 Didn't like the movie too much but as far as superheroes go, Thor is in my top 5! Great Job! I see a future cartoonist in the works. That's pretty good! It really is! That is totally impressive! I knew exactly who it was right away!! AWESOME!! Awesome Thor drawing! I love pictures like this. Thor - what a great drawing! It really is impressive. I think that is an excellent portrayal! What a great job he did!! Love it! Hey, that's a pretty damn good likeness!